During my time from february to april about 250 polo horses were on the ranch. I was assigned to a “petisero” named Andrés who worked daily with me. Of course at the beginning I had difficulties to understand the guys because they speak a totally different “castellano”. In the morning we went to get our 11 horses from the pasture land and rode them without saddle (only with halter) to the “palenke”, then the horses were cleaned up. Sometimes we went with the horses to the “pista de vareo” to train the horses. On the evenings we prepared the horses for the polo events or training (bandage, saddle). 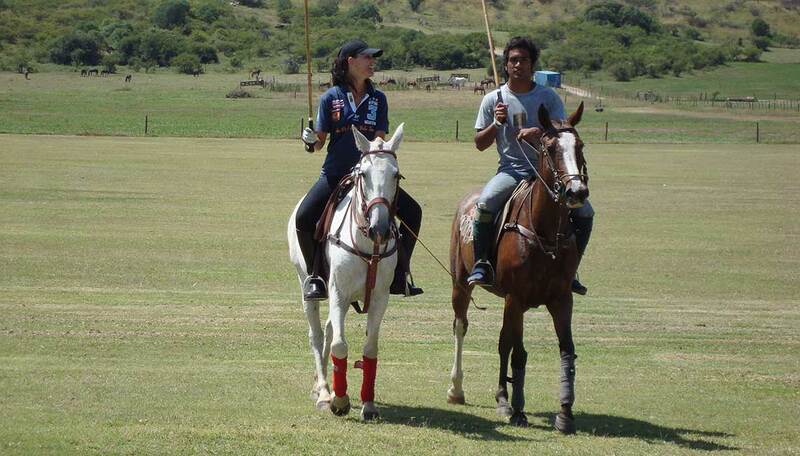 And of course I had some polo classes with Mariano (polo manager on the farm) what was a lot of fun. After a couple of weeks I could practise on my own with different horses I could choose from. From february to march we had quite a number of tournaments on the polo farm what made work even more interesting. Of course, this means that I also had to work on the weekends and my day off was on Monday and/or Tuesday. The accommodation on the ranch was good (in a separate house with kitchen and bathroom), we also had a female cook who cooked for us (staff and owner) and the cleaning women came several times a week. There was a washing machine beside the office to wash clothes. At the nearby village “La Pampa” (20 min. walking) you will find a small minimercado, where I could make shopping. You must like horses to work on this ranch – for me a paradise. Have a lot of fun during your stay at the polo farm! !